Rare Double Chamber Padlock, English or American, 18th Century. Rare padlock, huge size. This is a double chamber padlock, essentially there are two lock mechanisms sandwiched inside one lock body. You have to fully rotate the key within the first chamber to unlock the first bolt, then rotate the key to a 3pm position and drop it into the back chamber to operate the second bolt. You could lock it with one or the other or both bolts if you choose. Its either English or America, these were originally from England but they were copied in America by local blacksmiths. It dates from the late 18th century. 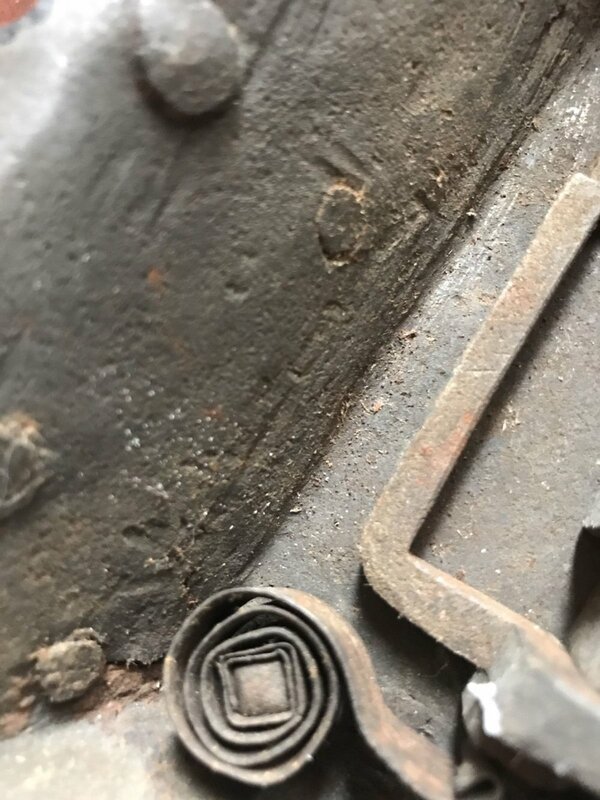 The key is original and fits extremely well, with no extra space and the profile of the teeth fits exactly as the shape of the keyhole and the wards appear to be intact as well inside the keyhole. A solid and substantial early padlock that hasn't been repaired inside. Fully functional and with strong springs. A larger size that makes it more rare as well. Please ask any questions prior to bidding. This is not a copy, this is an original 18th century antique. 4 5/8in tall x 3.5in wide x 1.5in deep inches. approx. 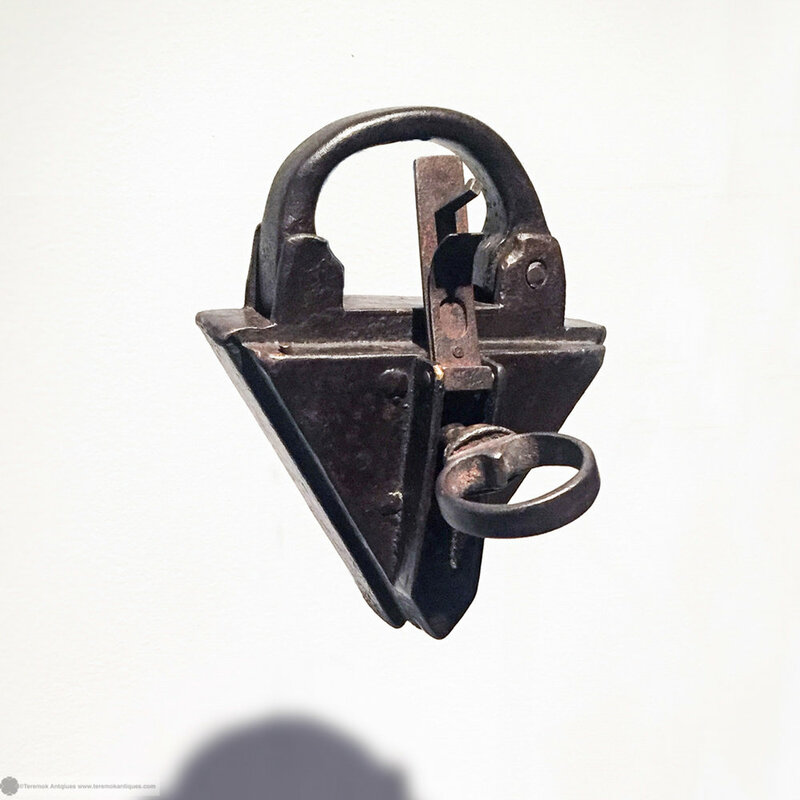 16-18th century German Triangle Padlock. Trianglular padlock, probably made in Nuremburg sometime between 1600-1750. Classic triangle padlock shape and features its original chain still attached. Seldom seen Persian brass or bronze padlock in the form of a face or possibly a lion. The mouth accepts the key (key looks like an antique replacement). The lock works with a simple spring lever mechanism, it is a little tricky to open but it does work without loose parts. There seems to be no internal keyhole shaft, possible that there never was. See last photo for known comparable example published in "Locks from Iran Pre-Islamic to Twentieth Century" page 71. Described there as "brass lion head". The eyes are glass or turquoise, one is missing. They appear glued (old) in place. I believe this is an 18th-19th century piece. Sourced from a reputable auction house in the UK. I believe this example to be original with possible repairs. There are two pins that look rubbed, and suggesting it may have been opened to repair it. There is also a shinny part on the lock front edge in the 4pm position, see pictures. 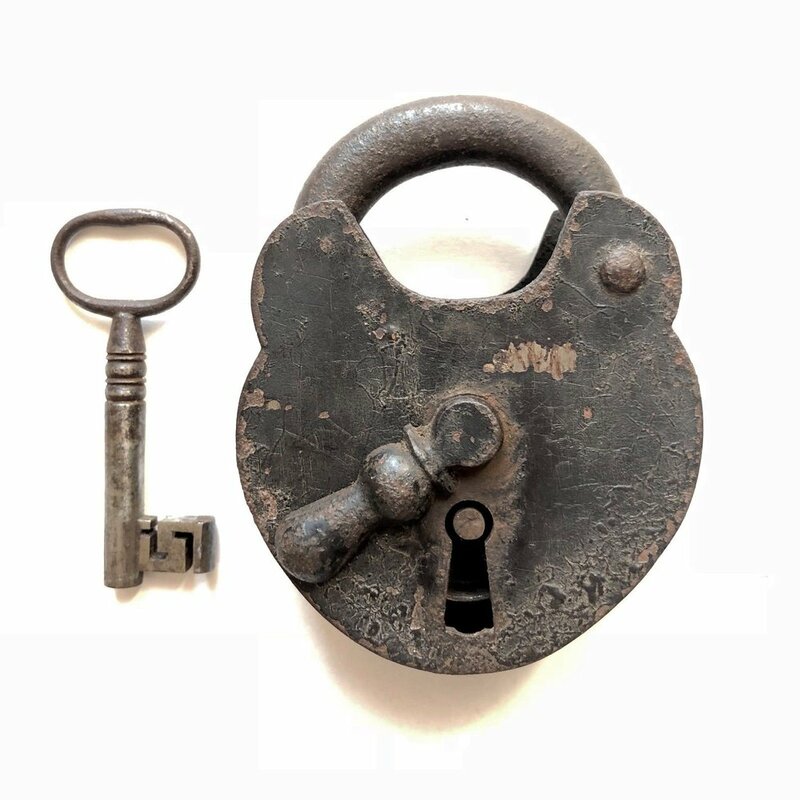 2.5in t x 1.5 w.
Early 15th century Iron Padlock with Original Key. Fantastic padlock in exceptional working condition. 15th-16th Century, probably Flemish or English. Shows a "vi" makers mark on the catch, see photos. Also has a collection or museum number on the back ? Works very well, strong spring closure holds the bolt in place. The shape evokes a star fort. Please ask all questions beforehand. Happy to provide any additional pictures. Rare piece! 17th-18th Century German Padlock with Original Key. Amazing all original 17th-18th Century German padlock. Heavy and substantial. Traces of a makers mark on the shackle. The key is pushed a third of the way in and turned to unlock it. Pushing it all the way in it wont turn. 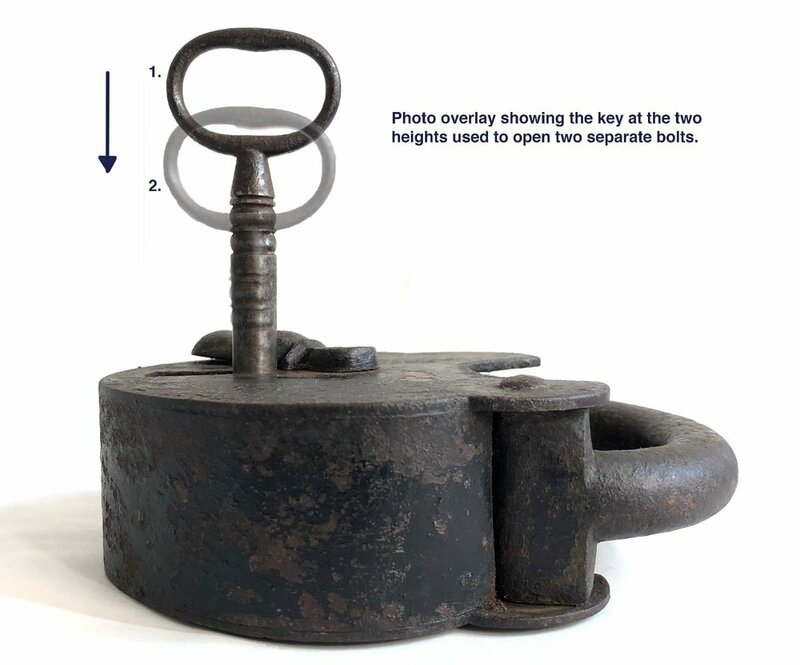 Subtle tricks and obstacles such as this are common (as were split shaft keys, extra turns and other tricks) in 18th century padlocks. Designed to deter obvious picking of the lock. It has been polished. 4t x2.5w x 1d inches. 17th-18th Century Iron Padlock with Original Key, German. Wonderful padlock from the 17th-18th centuries. German. The lock has the orignal key and is functional. The dark patina is stable and very pleasing. 15th or 16th Century massive iron forged padlock. Northern European. Complex lock which is delightfully revealed on the backside, which is missing. There was once a trick to open the keyhole cover. Scarce item and especially this large. No key but the mechanism works, tested, and one could be made.Please note this is not an altered door lock, it is a known style of medieval padlock. Renaissance Padlock, 17th Century. Circa 1650. This fantastic and rare padlock was made in the 1650's in Germany, most likely Nuremberg. Nuremberg was a hub iron manufacturing in the Renaissance and was noted for their arms and armor, locks and other forged products. This lock is reminiscent of an oak leaf. It has a beautiful form and each part is shows that it was carefully crafted. The piece is entirely original including the special shaped key. The diamond shaft of the key corresponds to a keyhole of the same shape with a collar inserted. This collar added a degree of security, making it harder to pick the lock. This is a rare padlock, made centuries ago by skilled craftsmen prior to the modern era of manufacturing. All parts were hand worked from hand forged iron. Renaissance Trick Padlock, 16th Century. Circa 1550. Renaissance Trick Padlock, 16th Century. Circa 1550. . Well over a pound in weight. 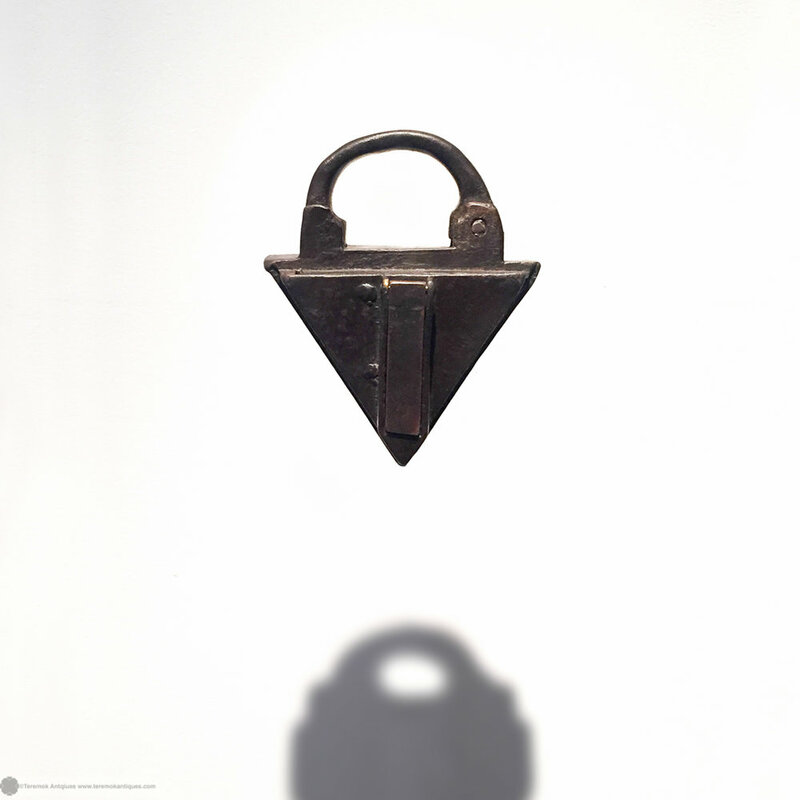 Wonderful triangular form trick padlock made in Germany in the 16th century, around 1550. Most likely made in Nuremberg. The lock is very heavy and large with functioning original key. The keyhole cover has a trick to open the door, see the video for how. All padlocks from the German Renaissance period are rare today and the triangle, sphere, and 'leaf' forms were most common. What sets this example apart is the trick door cover, this feature in this form is seldom seen on a triangular lock, making it special. Likely used on a massive iron strong box, maybe for a sea voyage or other journey, this lock has signs of use. Centuries of handling have given it a wonderful patina. The bow that locks through the hasp has signs of wear in the place it would have sat on the latch. There are various antique repairs to this lock, demonstrating its long working life. A wonderful example that makes the mind wonder just where this object has traveled since the 16th century. 6 h x 5 w x 2 3/4 d inches.